Facing federal bank robbery charges is a serious situation that requires you or your loved one to act immediately to fight the charges or appeal a conviction and sentence. It is important to understand the federal crime that you have been charged with and start seeking out competent bank robbery attorneys to defend yourself against these significant charges. The aftermath of a conviction can change the rest of your life, which is why you should be as prepared as possible to mitigate the impact of a federal indictment or conviction for bank robbery offenses, including sentencing guidelines enhancements. Bank robbery lawyer Brandon Sample works closely with clients who are facing such charges at all phases of the criminal justice process. Whether you have just been arrested or are trying to have your conviction overturned, the Law Offices of Brandon Sample has the in-depth experience you can rely on to help make sense of your legal defense options and to mitigate your bank robbery sentence. The crime of federal bank robbery is outlined in 18 USC 2113, which also sets forth severe penalties for someone convicted of this grave offense. Per 18 USC 2113(a), someone who “by force and violence, or by intimidation, takes, or attempts to take, from the person or presence of another, or obtains or attempts to obtain by extortion any property or money or any other thing of value belonging to, or in the care, custody, control, management, or possession of, any bank, credit union, or any savings and loan association” is guilty of the federal offense of bank robbery. Subsection b of the same statute also provides that the attempt to do so is a criminal offense. 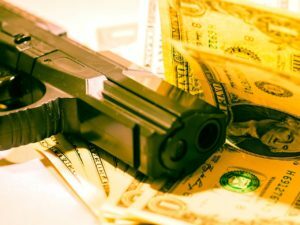 An experienced bank robbery attorney can assist you in understanding these elements and how the fact pattern of your unique situation corresponds. Even if you are only a participant in a bank robbery scheme and are not actually the person who takes any of the bank’s property, you will still face criminal penalties, codified in the U.S. Sentencing Guidelines, as outlined in subsection c of 18 USC 2113. This can also put you in jeopardy if an accomplice engages in other crimes during the commission of the offense. The reason why a bank robbery can be a federal offense even though a defendant may not cross state lines to commit the crime is that banks are treated as federal institutions. The fact that the property involved in a bank robbery is considered partly government property makes the penalties for being convicted of this offense much more severe than if the offender had robbed a private residence. The use of force inherent in the act of stealing money from a bank is what makes the crime classified as a robbery. What are the Federal Bank Robbery Sentencing Guidelines? All of the penalties for someone convicted of federal bank robbery as laid out by 18 USC 2113 are serious in nature, but the sentencing guidelines are enhanced depending upon whether the defendant actually used force and caused injury to another person in the act of the crime. The maximum bank robbery sentence for someone convicted of taking bank property through the use of force or intimidation under 18 USC 2113(a) is up to 20 years in federal prison. If someone steals property from a bank valued under $1,000 without the use of force, he may face up to one year in prison. If the property that someone takes is valued above $1,000, the bank robber may face up to 10 years in prison, per 18 USC 2113(b). According to 18 USC 2113(c), if someone merely takes or resells property obtained by someone without violence, as defined by 18 USC 2113(b), they are subject to the same penalties as the person who did the taking. If someone commits an assault against another individual in the act of attempting to take property from a bank, they may face up to 25 years in prison, per 18 USC 2113(d). If that assault results in death, the offender will be sentenced to a minimum of 10 years in federal prison and a maximum of a life sentence or the death penalty. Keep in mind that these are the statutory provisions and that an actual criminal sentence will largely be based on the applicable U.S. Sentencing Guidelines. Due to these significant bank robbery sentences, it is essential to retain the services of a bank robbery attorney as soon in the criminal process as possible. All of the criminal penalties listed above may also include expensive fines imposed by the sentencing judge, which may cause serious hardship in having to pay back after being saddled with a conviction on your record. By retaining a qualified bank robbery lawyer, you can mitigate your sentencing guidelines liability, along with applicable fines and restitution orders. Keep in mind that if an individual is injured during the act of the bank robbery, the defendant may also face a civil suit from that individual person in addition to the criminal penalties and fines he may receive. This is true whether or not the defendant anticipated that someone would be harmed by his actions in committing the offense. The potential fallout from being charged with a bank robbery offense is why it is so critical that any defendant facing such charges involve an experienced bank robbery lawyer at the outset of defending against these serious accusations. If you or a loved one have been charged with a federal bank robbery offense, formulating the best possible legal defense to the charges should be your top priority. Bank robbery attorney Brandon Sample of the Law Offices of Brandon Sample is standing by to help you understand your legal options in fighting a federal bank robbery charge. He has vast experience in representing clients charged with federal bank robbery offenses throughout every step of the criminal justice process, including the appeal of a conviction or sentence for federal bank robbery. Contact the Law Offices of Brandon Sample today at 802-444-4357 (HELP) to schedule a consultation with a bank robbery lawyer.